Applaud amazing dancers, then go sample ten or twenty caliente condiments. The 24th annual Oxnard Salsa Festival returns to Plaza Park on Saturday, July 29 and Sunday, July 30. 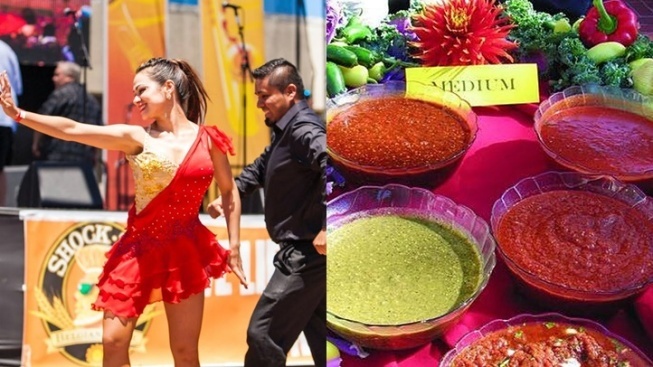 OXNARD SALSA FESTIVAL, a two-day fiesta at Plaza Park downtown. Live Latin jazz bands, and acts lending flavor to salsa-dancing classics, will give the get-out-and-spin part of the weekend much of its musical oomph, while a salsa-tasting tent will keep lovers of cilantro-tomato-onion combos dipping and trying, dipping and trying, again and again. Will hot sauces, a cousin to salsa but its own distinct thing, make a caliente cameo? It wouldn't seem like a salsa celebration without it. Is there a salsa recipe showdown? Oh, you bet. And is the whole thing free to check out, free in terms of admission and free in terms of parking? Both of those are yeses. The dates are Saturday, July 29 and Sunday, July 30, which, fingers crossed, will be on the warm side, to suit the salsa-riffic theme of the weekend. Is salsa dance your favorite dance? Is salsa your favorite food? Hello, Oxnard.